When it comes to feeding your baby, you want to make sure your baby gets the very best start to be healthy and happy. When your baby has colic, acid reflux, or lactose allergies, it can be hard to know the best way to ensure that his or her formula has all the vitamins and nutrients needed without being too hard on the digestive system. Two well-known formulas designed for babies with colic, allergies, or acid reflux are Similac Alimentum vs Enfamil Nutramigen. Since these products seem to be so similar, how can you decide which is best to use? This article examines the two formulas carefully, including their benefits and drawbacks, to help you decide which formula is best for your baby. In order to determine which product is best for your baby, it’s necessary to compare Similac Alimentum and Enfamil Nutramigen. The products are similar, but have notable differences that can impact your decision. Examining these two products side-by-side can highlight their benefits and drawbacks for baby’s nutritional needs. This section explains the products, highlights their pros and cons and outlines key features of the formulas. Similac Alimentum is a baby formula designed to be hypoallergenic, which can be used for babies with colic, acid reflux, gas and allergies. The pre-digested formula is easier on babies’ digestive systems because the proteins are already broken down. The formula is available in powdered form and ready-to-feed formula. This formula is widely available where formulas are sold. This product is designed to be used by families who have babies with sensitive digestive systems, colic, acid reflux, gas or allergies, such as lactose intolerance. The product is not designed to completely replace all other formula or breastmilk. It is intended to be a supplement to other feedings. This suggests that the formula does not include all the vitamins and nutrients needed to nourish an infant. The primary benefit of Similac Alimentum is that its pre-digested formula is easier on babies’ digestive systems. When babies have colic, gas or allergies, the work done by the digestive system can lead to more problems. However, the pre-digested formula ensures that the baby gets the broken-down proteins into his or her body without putting a strain on the baby’s system. Similac Alimentum is a good option for parents who need hypoallergenic formulas for their babies. It addresses your baby’s immediate nutritional needs and is gentle on his or her digestive system. However, it may be difficult to get the baby to drink the formula and it is not designed to be a total alternative to other feeding options. 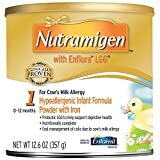 Enfamil Nutramigen is a hypoallergenic formula made with iron. The formula is designed to be effective for babies with gas, colic, acid reflux, upset stomach or lactose intolerance/allergies. It is available in both powder and ready-to-feed formula. This formula is widely available where formulas are sold. This product is designed to be used by families who have babies with sensitive digestive systems, colic, acid reflux, gas or allergies, such as lactose intolerance. The formula is designed to include all the vitamins and nutrients an infant needs to grow healthy and happy. A prominent benefit of Enfamil Nutramigen is that it is both soy- and dairy-free. Removing these ingredients helps reduce the chance of allergic reaction in babies. Even when removing these ingredients, the formula offers all the vitamins and nutrients a baby needs to grow strong and healthy. Enfamil Nutramigen is an effective hypoallergenic alternative to traditional formula. In addition to containing all the nutrients and vitamins needed, Nutramigen is dairy- and soy-free to reduce the chance of allergic reaction. However, due to the taste of the formula, it may be difficult to get your baby to drink it successfully. Though Similac Alimentum and Enfamil Nutramigen are the best-known hypoallergenic baby formulas available, there are alternatives parents can consider for their babies. Knowing about alternatives can be helpful if your baby does not respond well to either Alimentum or Nutramigen to relieve symptoms. It is important to examine the alternatives carefully to determine whether they are a good fit for your baby. Another well-known alternative to these hypoallergenic formulas is Gerber Extensive HA. This formula is only available in powdered form. It is designed specifically for babies with allergies to cow’s milk protein. This formula is nutritionally-sound, offering all the vitamins and nutrients a baby needs to grow healthy and happy. The formula is made with 100% whey protein, which is broken down for easy digestion. The cost of Gerber’s hypoallergenic formula is comparable to its other formulas. Q. Is it okay to give babies formula? A. The most important part of caring for your baby is giving your baby everything needed to grow healthy and strong. While studies indicate that breastmilk is best for babies, it may not always be possible to exclusively breast feed a baby. Even if you are breastfeeding, your baby may need formula to supplement and promote healthy growth. Q. 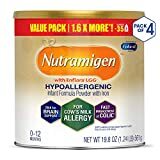 Can I mix hypoallergenic formula with traditional formula? A. If your baby has symptoms that suggest allergies, colic or acid reflux, hypoallergenic formula will help prevent the symptoms. If your baby is reacting to something in a traditional formula, any amount of that formula can lead to symptoms. If your baby’s pediatrician recommends hypoallergenic formula, it is recommended that only hypoallergenic formula be used. Q. How do I know if the formula is working? A. 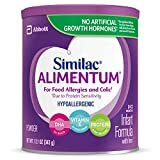 Both Similac Alimentum and Enfamil Nutramigen will show results in approximately 48 hours after starting feedings with the hypoallergenic formula. After that time, you should see reduced symptoms of the problem, such as gas or colic, and have a happy, healthy baby. If you have been feeding the baby with the hypoallergenic formula for several days without any change, the formula may not be working to resolve symptoms. Q. What are signs of colic? A. Colic is characterized by intense periods of crying, which usually occurs in the late afternoon or evening and lasts several hours. Your baby’s face will probably be red and flushed when crying. Your baby may also clench his or her fists and draw the knees up to the tummy while crying, or your baby may arch his or her back while crying. When your baby is in a crying bout, he or she may be inconsolable. Q. What are signs of gas? A. Babies who are gassy are often fussy for no discernible reason, especially after eating. Your baby may also bring his or her knees up or stretch out to try and find a comfortable position. Your baby may also have increased flatulence or burping, especially after meals. Q. What are signs of acid reflux? Q. What are signs of lactose intolerance/allergy? It is important to note that babies who are breastfed can be affected by lactose intolerance because their vitamins and nutrients are dependent on the vitamins and nutrients consumed by the mother feeding the baby. If you consume a lot of lactose, your baby may experience more symptoms. Q. What should I do if I think my baby needs hypoallergenic formula? A. If your baby is showing signs of gas, acid reflux, colic or lactose intolerance, it’s a good idea to make an appointment with your pediatrician for an examination. The pediatrician will be able to find the exact cause of your baby’s problems so it can be treated appropriately. In addition to hypoallergenic formula, your baby may need medication. Your pediatrician can help decide the best course of action. A. As the parent of your baby, you are the one who knows what’s best for your baby because you are with him or her every day. Your pediatrician can make recommendations based on examination, and it is up to you to implement those recommendations. That is why it is important for you to research hypoallergenic formulas to decide which formula would be best for your baby’s health needs. While both Similac Alimentum and Enfamil Nutramigen are effective options for hypoallergenic formulas when babies have allergies, gas, acid reflux or colic. in a comparison, there are many similarities between the two products, including the cost being higher than traditional formulas and other hypoallergenic alternatives. One advantage of Enfamil Nutramigen over Similac Alimentum is that Nutramigen includes probiotics. Probiotics are useful for promoting gut health and establishing digestive health from an early age. DHA levels are also higher in Enfamil Nutramigen in comparison to Similac Alimentum. Based on the features of the formulas, it is recommended that new parents start with Enfamil Nutramigen for their babies. It has better nutrients for babies’ health. However, if the baby does not respond well to the Nutramigen or it does not provide the growth needed, Similac Alimentum is an alternative option for babies. When your baby has colic, gas, or allergies, you know how important it is to find relief for pain and make sure that your formula gives your baby all the vitamins and nutrients needed to grow healthy and happy. Whether you choose Similac Alimentum or Enfamil Nutramigen (or another alternative), a hypoallergenic formula may be just what your baby needs. HybridMom.com is a participant in the Amazon Services LLC Associates Program, an affiliate advertising program designed to provide a means for sites to earn advertising fees by advertising and linking to Amazon.com. Additionally, HybridMom.com participates in various other affiliate programs, and we sometimes get a commission through purchases made through our links.